The Studio Edition hardcover is 140 pages, 12 x 17 inches. 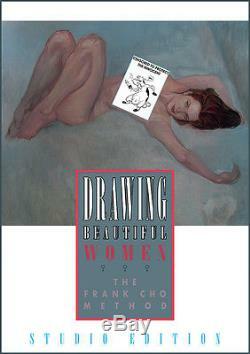 This copy comes with two original drawings inside the book by Frank Cho. 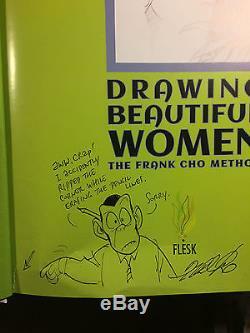 The first is a full page large finished drawing in ink of Frank Cho's Jungle Queen character on the front reverse endpaper facing the title page. The second drawing is a hilarious add on the title page. Frank accidentally made a rip on the page while erasing the pencil lines. So, he added this drawing to explain what happened. Personally, I find this to be a bonus and funny extra personal touch to the book. The censored label on the cover does not appear on the actual book. Flesk Fundraiser Event to Support Stoke Out Santa Cruz! 100% of the proceeds from this series of Flesk auctions will benefit our local youth in need here in Santa Cruz, California. Are making this happen and I'm proud to play a small part in the fundraising efforts. The Live Oak School District has asked for help for 300+ kids in the most need. More than half are families in transition (need housing). Please see our other auctions for more unique Flesk books with original drawings. This fundraiser is very personal to me. Life was challenging for me growing up and I can relate to these kids. It's my goal to raise as much funds as possible to get these kids Stoked! John Fleskes Owner of Flesk Publications Director of Spectrum Fantastic Art. All orders placed though Flesk are 100% guaranteed. Once you receive the item, please let us know if you have any issues. We will take care of you. The item "Frank Cho Original Jungle Queen Art in Oversized Flesk Book Charity Auction" is in sale since Friday, November 25, 2016. This item is in the category "Collectibles\Comics\Original Comic Art\Other Original Comic Art". The seller is "fleskpublications" and is located in Santa Cruz, California.